Exfoliation is essential for a bright, smooth, dewy complexion. We need to slough off the old dead skin cells regularly to reveal the fresh new skin below. Scrubs, chemical exfoliants and abrasive salon treatments can be harsh, tearing and stripping the skin of its essential oils. Dermaplaning is an exfoliating treatment that leaves your skin looking brighter, smoother, glowing, and more youthful... without the damage. Dermaplaning improves the skin texture within one session and the results last for weeks. We use a very thin blade made from titanium, held at a 45-degree angle, to lift the superficial dead skin while simultaneously removing fine, downy hair. The blade is used on clean, dry skin on the forehead, cheeks, chin, nose and neck. 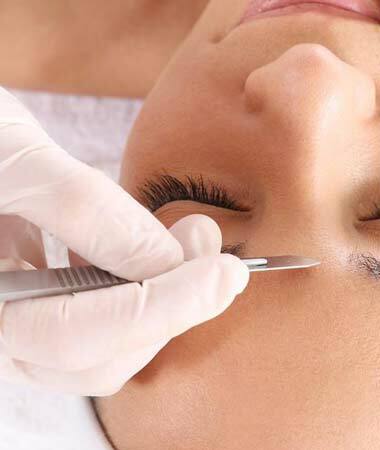 Dermaplaning is a painless treatment, with no discomfort. The only possible side effect is a slight redness, which fades almost immediately. 1 x Dermaplaning session costs £45.00. "Definitely have more energy and less bloating since starting Colonic Hydrotherapy sessions with Collette. Really feeling better all round." "I've been so uncomfortable with bloating for past two weeks! One trip to the clinic today with Collette and i'm feeling great and bloating gone!"